“Tapas” is one of the most internationally recognised Spanish word. 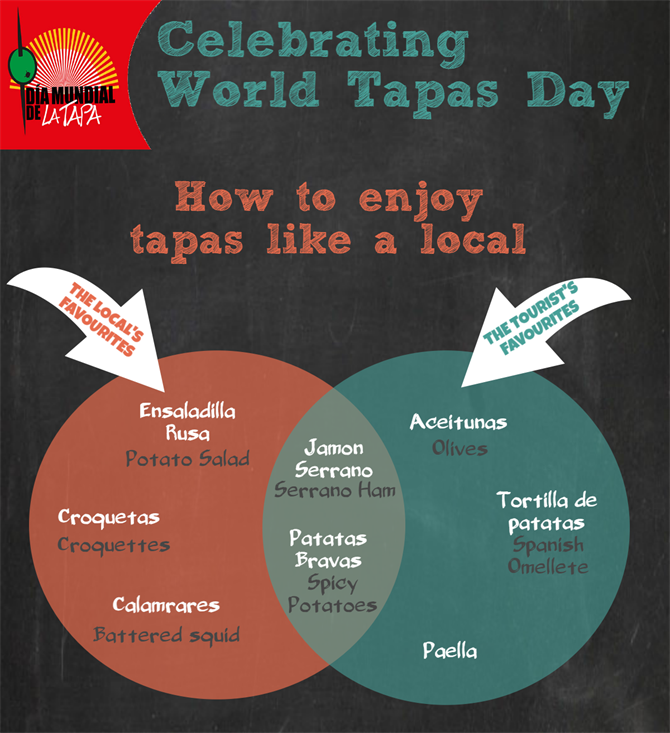 The small but mighty dishes are being honoured with their own international day of celebration as Thursday 15th June is declared World Tapas Day. 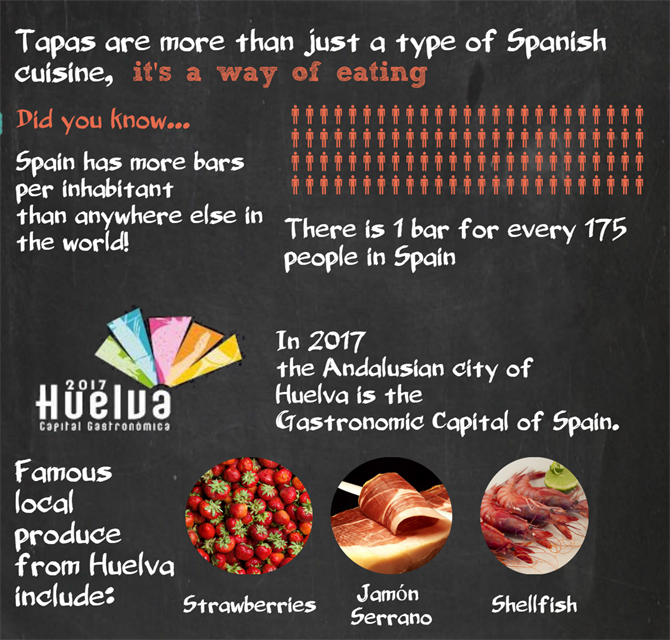 This handy infographic “How to Enjoy Tapas Like a Local” created by Spain-Holiday.com in celebration of World Tapas Day 2017 explains the tradition of tapas and how to enjoy them like a local. 5,304 million tapas are eaten every year in Spain, according to a study by tapas restaurant Lizarron. Going for tapas is a custom ingrained in Spanish culture. It is a hugely popular culinary and social experience. Spain has the highest number of bars per inhabitant in the world with 1 bar for every 175 inhabitants. Most of these bars will serve tapas and over half of them (58%) offer free tapas with every drink. 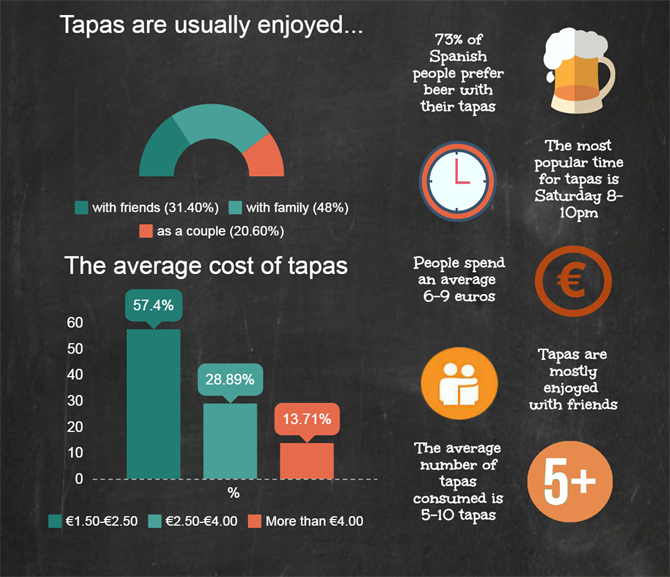 When it comes to eating tapas, a recent study has shown how locals in Spain and tourists enjoy tapas varies greatly. The holidaymaker in Spain is easy to spot, enjoying a sangria with their tapas, but the Spanish prefer a nice chilled beer (73%) or a glass of wine. The most popular tapas that tourists choose include Spanish omelette and paella. Spanish Serrano ham and “patatas bravas” (fried potatoes with a spicy tomato sauce) are also popular with holidaymakers and locals alike. Favourite tapas among the locals include “croquetas” - hot crunchy croquettes with a creamy béchamel and ham filling, “calamares” – fried calamari rings, and “ensaladilla rusa” confusingly called “Russian Salad” that is made with potatoes. Weekends are peak time for eating tapas (84.6%). The most popular time to go for tapas is in a Saturday evening, with friends, or on a Sunday with family. The average number of tapas eaten is 1-3 tapas but this increases at peak “tapas time” between 8-10 pm over the weekend to more than 5 tapas per person – perhaps the secret to not getting too drunk is to eat a tapa with every drink? Food tourism is on the rise. Over 50% of tourists say that gastronomy plays a fundamental role in deciding where to go on holiday. Last year, a record breaking 10 million foodie tourists visited Spain. 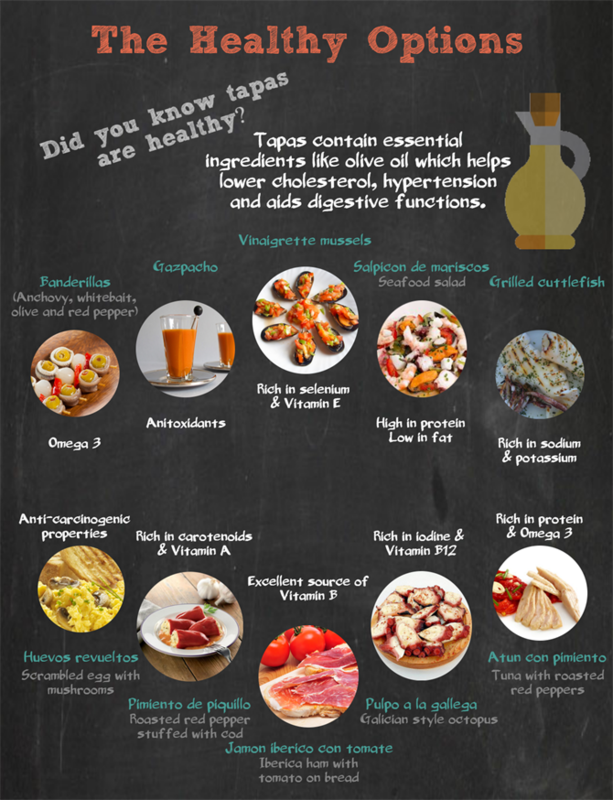 A reason for the popularity of Spanish cuisine is the quality of the produce such as wine, olive oil and local produce such as fresh vegetables and Iberian ham. Spain has a total of 28 PDOs (Protected Designation of Origin) recognising the quality and origin of local produce such as cava, Serrano ham, and Manchego cheese as well as Rioja, Ribera del Duero and Sherry wines. There is a total of 6 restaurants in Spain among the Top 50 Restaurants in the World Spain also has 9 restaurants with the highest accolade of 3 Michelin stars awarded and a total of 174 Michelin stars, ranking Spain 6th in the world. For those looking to enjoy a foodie holiday in Spain, Jannich Petersen, COO of Spain-Holiday.com recommends visiting the Andalusian city of Huelva. “Huelva is not on the mass tourism radar at all but it has a lot to offer visitors especially those wishing to enjoy the finest Spanish gastronomy. Huelva has been selected as the Gastronomic Capital of Spain in 2017. The city, located on the Atlantic coast on the Spain-Portugal border, is gastronomically renowned for locally sourced produce including strawberries which are exported to Wimbledon, acorn-fed Jabugo ham and ocean-to-table produce such as cuttlefish, clams and white prawns which are celebrated by chefs around the world. For those looking to explore Spain through its gastronomy, Spain-Holiday.com is the leading holiday rental website in Spain, with over 10,000 luxury villas, front-line beach and family-friendly properties to choose from.